Currently in Europe there are over 1500 SMB strappers in operation and in USA they hold approximately 80% of the high-speed newspaper industry. SMB machines are the fast on the world market, strapping at speeds of up to 45 bundles per minute. SMB machines are also the reliable on the market; with no service needed until 1,000,000 cycles. SMB machines are now in stock at Australian Warehouse Solutions (AWS) . Peter Holmes, managing director of Australian Warehouse Solutions said, “The SMB machines are relatively new to Australia. To get established we would like the SMB strappers to be in the field and we invite companies with high volume PP strapping applications to trial SMB for 6 months without obligation”. The SMB strappers are fitted with jumbo 12, 200 metre rolls of strapping that dramatically reduces roll changes. 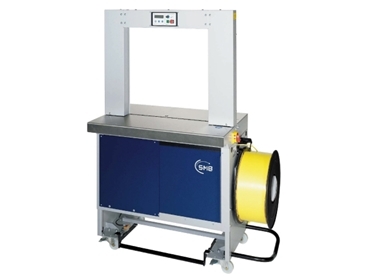 They are also the high-tech strapping equipment and the SMB range is comprehensive strap inline, off-line, automatically or semi-automatically.